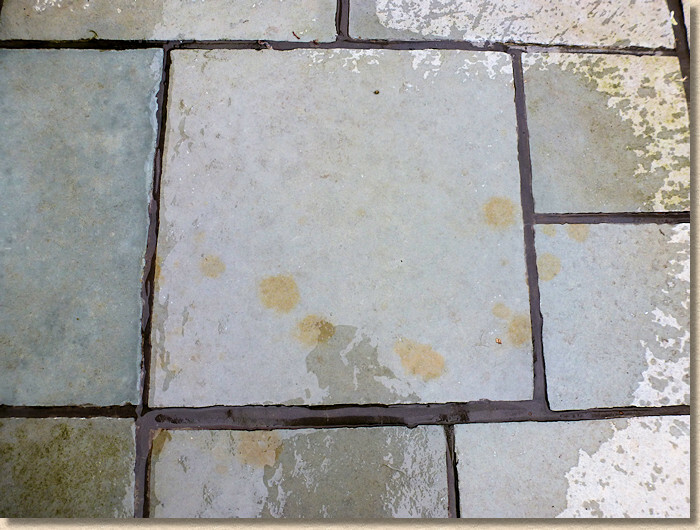 I very, very stupidly cleaned my newly-laid Indian sandstone paving slabs with brick acid, and now they look terrible, blotchy colours. Is there anything I can put on them to improve their look? 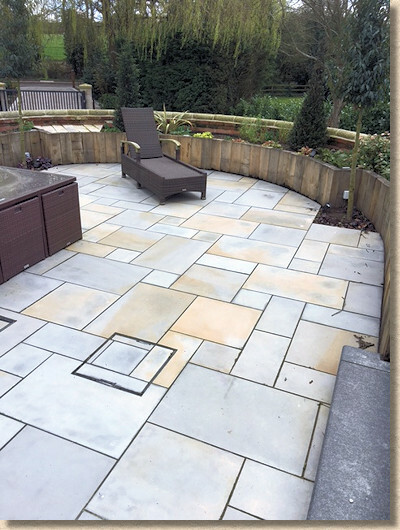 Although the damaging effect of some acids, notably hydrochloric, on some types of stone used for paving, especially but not exclusively the imported Indian sandstones, is well known throughout the industry, there are still products out there, being sold at otherwise respectable DIY sheds and Builders' Merchants, that claim to be patio cleaners but are actually based largely on hydrochloric acid. Occasionally, tucked away in the teeny-tiny print on the back of the container, or on a separate 'How To Use' leaflet that no one ever sees, let alone reads, it may well warn that 'care should be taken with certain types of patio paving' or other mealy-mouthed words to the same effect. And then it's too late. 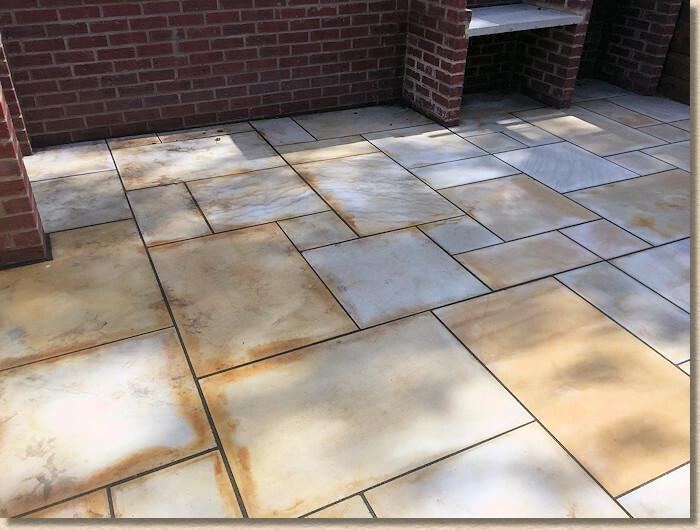 The previously lovely but slightly mucky paving is now a total mess with various shades of garish orange splodges and rust marks as the acid unleashes the previously held-in-check iron minerals within the stone and they display themselves on the surface. The paler coloured sandstones seem to be most vulnerable. The otherwise excellent Kandla Grey often falls victim, its gentle, slivery-grey tones forming the perfect foil to loud and brash rust markings, but Raj, Camel, Autumn Brown and many others can be affected, and even some of the limestones are not immune. Some granites and similar stones may exhibit dark patches, rather than orange or rusty stains. And sometimes, the source of rust is not the paving itself, but an external treatment, most commonly mosskiller (ferrous sulphate) or even metal patio furniture. The bad news is that there's no off-the-shelf, works-every-time answer to this all-too-common problem. Some damage is relatively minor, and it may be possible to remove minor or light rust staining using a good quality *acid-free* rust remover for paving, such as Lithofin Rust-Ex or PaveTuf Rust Remover. Given these are relatively low-cost products, they are often a good place to start as there's little to lose. Perversely, it may seem, a different acid, oxalic acid, is also able to remove some rust staining but as the strength of the product supplied can vary enormously from supplier to supplier, careful testing on a discrete area prior to wholesale sloshing onto the affected surface is VERY strongly recommended. 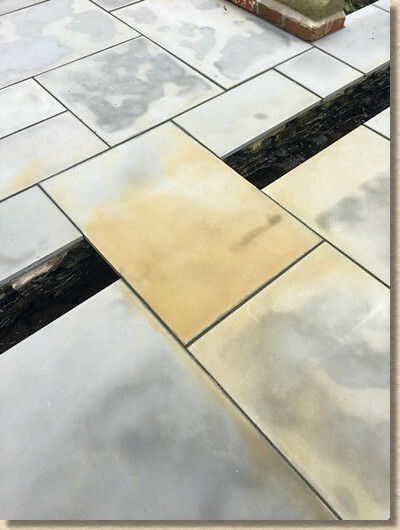 With some stains, using a good quality colour-enhancing sealant can make the disfiguration seem to all-but disappear, but the results can be hit-and-miss, and not everyone likes the almost wet-look that is usually needed to mask the staining: it can make the stone noticeably darker. Have a look at the sealant trials undertaken by this website a few years back - not all sealants are what they claim, and many of the brands sold in DIY sheds and Builders' Merchants are little more than poor quality varnish. Bear in mind that, generally speaking, when it comes to good quality paving sealants and colour enhancers, you really do get what you pay for. However, in many cases, even using a colour enhancer isn’t adequate: the staining may still show through; in some cases, it can even appear more obvious; all too often, what seemed to work at first disappointingly starts to dissipate over a few months and, very soon, it's right back to square one. On the plus side, left untreated, most acid staining will weather out over a period. That period may be just 12 months or so, if you're really lucky, but it's more often in the 4-7 years range, just depending on what sort of weather we get. And, at the end of the day, many, many jobs end up having the most severely affected flags replaced - it can be cheaper to rip out half-a-dozen or so flagstones and re-pave with new than spend significant sums of cleaners, rust removers, colour enhancers, sealants, professional cleaning and all that labour. Some rust stains are not worth treating - just replace! The possibility of using sand- or grit-blasting is sometimes raised, and while this will work in some instances, it isn’t the straightforward answer it may first appear to be. First of all, how deep does the rust staining penetrate? If it’s just on the surface, or a millimetre deep, then blasting away at the surface will, most likely, remove all of the affected stone. But what if it goes deeper than that? Or what if it’s a concrete paving? Or a specially textured paving? Blasting the surface will eat away at that surface but there is a limit, and if it’s concrete or textured, blasting can destroy the distinctive surface characteristics. When blasting could be used, the potential cost has to be considered. The abrasive grit used in such a procedure has to be contained. It can’t be allowed to blow around just anywhere, so the treated area has to be sealed off. That carries a not insignificant cost. Then there’s sourcing a specialist cleaning team with all the right gear, which again, won’t be cheap. And then consider the effect of blast cleaning. No matter what paving is being treated, blasting will most definitely change its appearance, maybe only slightly, but changed it will be, and so it’s not just the affected areas that need to be treated but the whole area, so that everything matches on completion. You will be paying to clean unaffected paving. All too often, blasting seems like the answer, but when the cost is determined, it would actually be cheaper to replace the affected paving. As stated right at the outset, there is no stock answer. Each job is different and has to be judged on its merits. How bad is the staining? How many flags are affected? How good a clean is required? How much can be spent? How important is the paving? Once this is understood, then, and only then, can a suitable and appropriate remedial strategy can be put together.